Eleven faced Rudraksha or Ekadash Mukhi Rudraksha has eleven natural lining on its face. This bead is generally found in oval or round shape. The deity of this Rudraskah is Lord Hanuman. 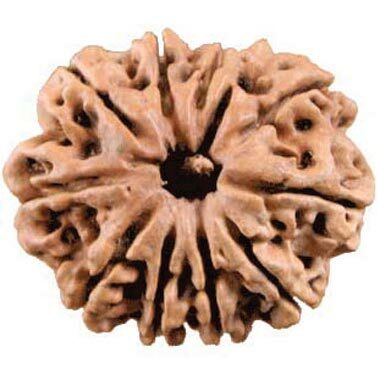 This Rudraksha does not have any ruling planet. This bead gives courage, confidence and fearlessness to its wearer. The karmic doshas are washed away and the negative effect of bad planets like Mars etc. are gradually removed and wearer is blessed with the blessings of Lord Hanuman (the eleventh incarnation of Rudra) who is considered the protector from all types of evil including ghosts etc. Eleven faced Rudraksha is recommended for those who are engaged in adventurer’s activities and are prone to injuries and accidents. With the blessings of Lord Hanuman, the wearer is protected from such eventualities and helps him to lead a successful life. This is also a good bead for purpose of meditation. This Rudraskah helps a person from acute alcoholism and liver problems arising due to this habit.